Baseball Plans To Ban Home Plate Collisions; Good Idea? : The Two-Way When runners barrel into catchers, the impact can send one or both to the injured list. Major League Baseball is moving to make it against the rules for a runner to intentionally "target" a catcher and for a catcher to block home plate. Pete Rose of the National League barreled into American League catcher Ray Fosse at the 1970 All-Star Game in Cincinnati. It's one of the most famous home plate collisions in Major League Baseball history. It's one of baseball's "most traditional and most violent plays," as NPR's Tom Goldman says. Starting as soon as next season, though, Major League Baseball will move to ban intentional collisions at home plate involving runners trying to score and catchers trying to tag them out. According to MLB.com, "the decision to eliminate collisions didn't become a serious topic of conversation until last month at the General Managers Meetings, but the idea quickly caught fire. Managers Mike Matheny of the Cardinals and Bruce Bochy of the Giants, both former catchers, led the push." But ESPN notes that the first rumblings about a rules change go back a little further: "Discussion to limit or ban collisions has intensified since May 2011, when San Francisco's Buster Posey was injured by Florida's Scott Cousins. Posey, an All-Star catcher, sustained a broken bone in his lower left leg and three torn ligaments in his ankle, injuries that ended his season." Not only is there concern about the type of injuries Posey sustained, but also about the possibility of concussions. -- "Catchers will not be allowed to block home plate. -- "Runners will not be permitted to target the catchers. -- "The question of whether or not the plate was blocked or the runner targeted the catcher will be reviewable, with an immediate remedy available to the umpires. -- "Catchers or runners who violate the new rules will be subject to disciplinary action." As for when this might happen, MLB says a final draft of the new rules is expected to be "approved by the [league's] Rules Committee and then submitted for a vote at the next quarterly Owners Meetings in January. Finally, it must be approved by the Major League Baseball Players Association. Mets general manager Sandy Alderson, chairman of the committee, is confident all that can be accomplished before the 2014 season opens." If all those steps aren't taken in time for next season, MLB could make the change without the Players Association's approval for the 2015 season, NPR's Goldman says. One of the most famous collisions at home plate in recent decades, of course, is the one between runner Pete Rose and catcher Ray Fosse at the 1970 All-Star Game. There's video of it here. Fosse suffered a broken bone in his left shoulder. Rose doesn't like the idea of changing the rule. "What are they going to do next, you can't break up a double play?" he said Wednesday in a telephone interview with The Associated Press. "You're not allowed to pitch inside. The hitters wear more armor than the Humvees in Afghanistan. Now you're not allowed to be safe at home plate? What's the game coming to? Evidently the guys making all these rules never played the game of baseball." 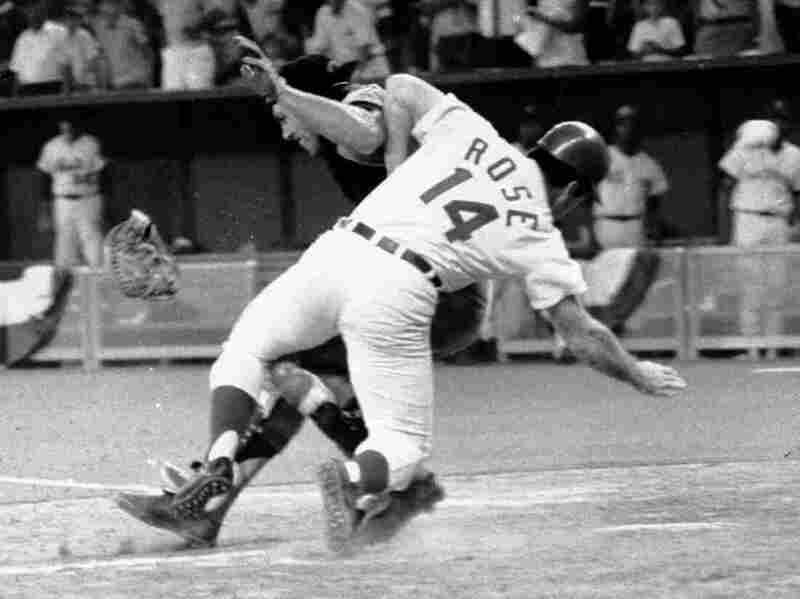 Rose has often noted that Fosse was illegally blocking the plate before their famous collision, because the catcher did not have the ball. We're wondering what fans think about the ban.